Keen for a healthy and delicious mid week staple? Here it is! Wild salmon delivers valuable protein, good essential fats and calcium from those edible bones. 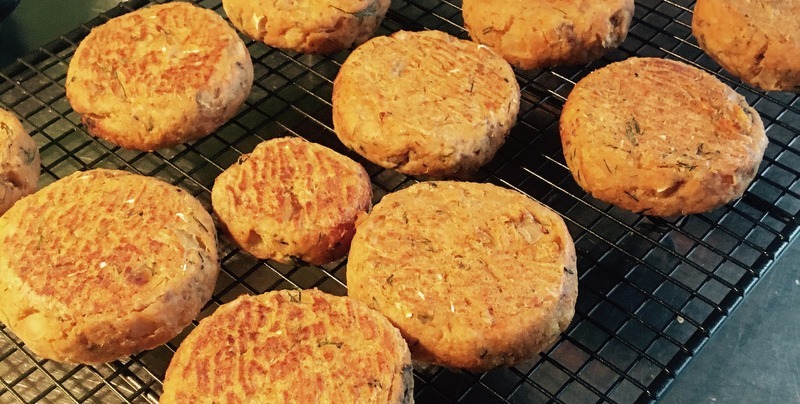 I like roasting the sweet potato ahead of time, meaning that when I am ready to cook I can jump right in and get the patties done! Serve with a green salad and sliced avocado. Some sauerkraut on the side brings extra goodness and yumminess. Place the sweet potato on a baking tray lined with baking paper and bake for 45 minutes, or until soft and starting to caramelise on outside. While the sweet potato is in the oven, drain the salmon very well, place in a mixing bowl and fluff it up a little with a fork. Use some paper towel to soak up any excess liquid (this is important as otherwise the patties will be too moist). Heat olive oil in a pan, add the onion and sauté on low heat until translucent (about 5 minutes). Add the onion to the bowl. Add in the quinoa flakes/crumbs, dill, egg, salt and some pepper. Once the sweet potato is ready, remove from the oven, slice lengthways and allow it to cool. Scoop the flesh out of the skin (discard skin) and add to the bowl. Refrigerate mixture for at least 30 minutes. Remove mixture from the fridge. Form mixture into patties (roughly 80g each) and place on baking tray. Bake for approx. 15 minutes, or until golden on top. Remove tray from the oven and turn them over. Bake for a further 10 minutes, or until golden on the second side.